Digital goods management: WebSite X5 Professional from version 13.1. Automatic order processing: WebSite X5 Professional from version 17. The only difference between physical and digital products is that one is material and the other isn't. An immaterial product has certain advantages: you don't run out of copies, they don't take up space, you don't have to worry about shipments and, once you've organized the sales process, you can earn money with a minimum amount of effort. There are various different kinds of digital products nowadays: ebooks, digital photos, music files, videos, templates and Web graphics, apps for mobile devices and, obviously, all the software. You don't have to be a pro to create fantastic digital products. If photography is your hobby and you've taken some good shots, why not try and sell them, instead of leaving them on Instagram. Or if you like writing stories, turn them into ebooks and make some money from them. Selling digital products may be your main source of income, but it could also be a way to make your hobby earn you a bit extra pocket money through your website or blog. If the idea of selling digital products appeals to you, but you're not sure how to go about it, carry on reading this guide: it's easier than you think. manage orders from the online Control Panel or using the WebSite X5 Manager app. From Step 1, go to the Advanced Settings and click on Data Management. 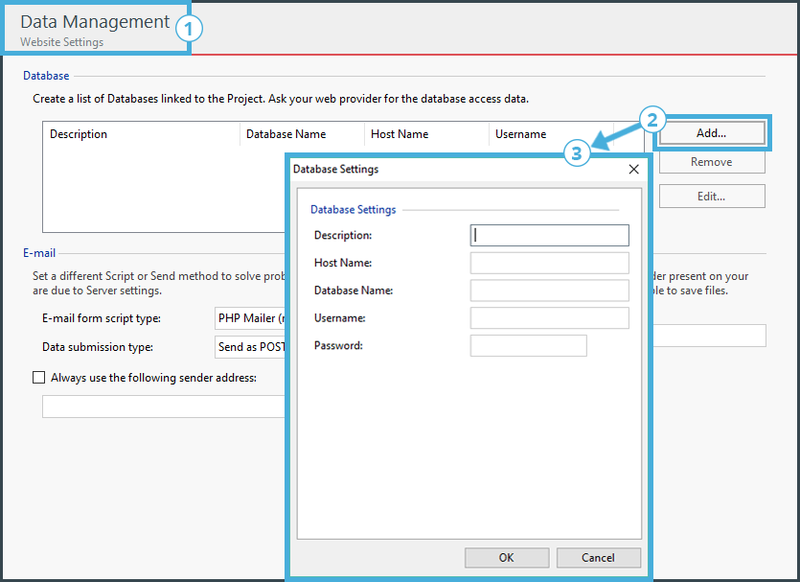 Click on the Add button in the Data Management window and add the parameters that identify the database you will use in the new window that opens. Now that the database is linked to your project, you can use it in your online store. #tip If you don't know how to configure the database, contact your provider: check that your web hosting offer includes database integration and ask for the parameters for accessing it. Stay in Step 1, Advanced Settings, and click on Shopping Cart: go through the various sections in this window to set up your online store. Go to the Products section. Select the appropriate category, click on the New Product button and give all the necessary information in the Product Settings window. When you confirm the settings, you will see the new product in the summary table. Repeat these operations for all the products that you want to sell in your online store. #tip Save time! If you've already got a product catalog in .TXT or .CSV format, you can import it using the "Import Products" button. In the Digital Product section, select the Digital Product option and enter the name of the file containing your ebook: you can import a file from your PC or one that has already been loaded online. #tip Protect your ebook. If you select the "Use temporary Download Link" option, each customer will be given a different link, that works for a given number of days only, to download the ebook. 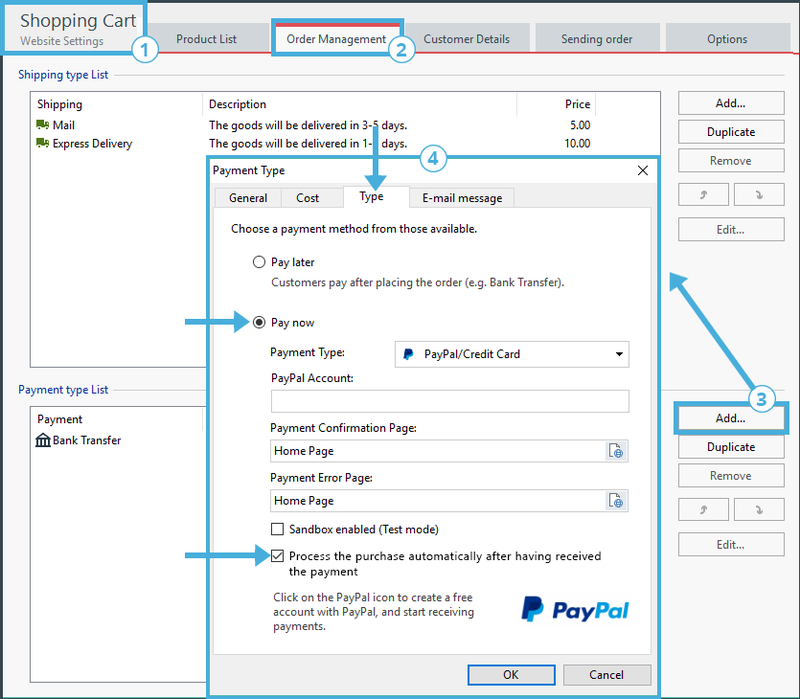 In the E-mail message section, add a brief description of how payments are made with PayPal: remember that this text will be used in the order confirmation e-mail that is sent to customers. #tip Automatic order processing. The "Process the purchase automatically after having received the payment" option has been introduced for WebSite X5 Professional 17. If the shopping cart contains both physical and digital products, the order cannot be processed automatically. #tip Start receiving payments immediately. Start receiving payments immediately. If you haven't already done so, open your PayPal account, free of charge. 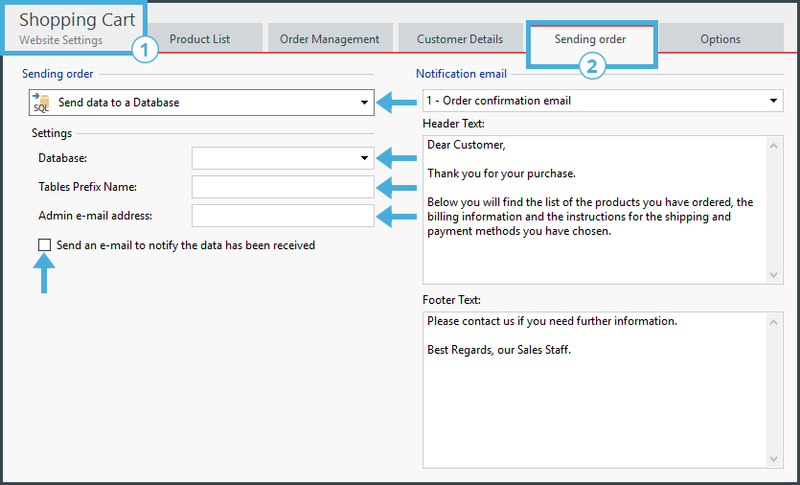 Go to the Send Order section in the Shopping Cart window and select Send data to a database in the Send and Notifications section. Write an Introductory text and a Closing text. #tip More details. For further information on notifications, see How to write a notification e-mail. Click on the button to add a Link to the image: select Add to Cart in the new window, enable Add the selected product directly to the cart and then select the ebook that is to be bought. Optimize your store. A store's success depends on how efficient the buttons are. Try the Animated Button and and Hover Button optional objects to create even more attractive buttons. #tip Save time! 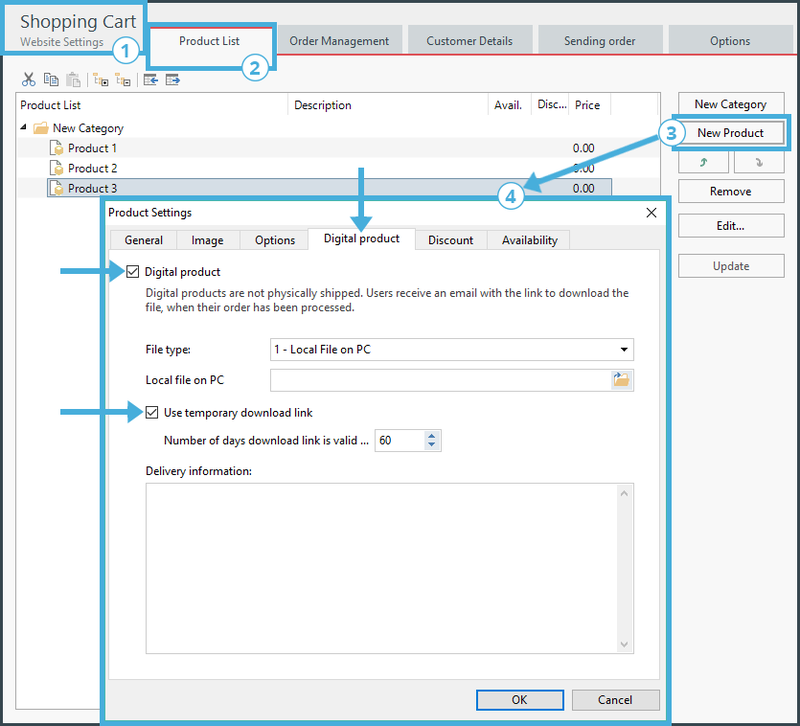 If you have a lot of products and you don't want to create a page for each one, use the Product Catalog object: the program will automatically create a page for each product. Once you have set up the cart and published your project online, you can start working on how to advertize it and manage the orders. You'll find this by typing your website's URL address, followed by "/admin" (for example, www.mysite.com/admin). Log in with the Administrator group credentials that were specified in the Access Management section (in Step 1, Advanced Settings). The WebSite X5 Manager App: this is available free of charge for both iOS and Android. Install it and add your website to the list of managed websites. When you have done this, you can access the main dashboard. There is a Shopping cart section both in the Control Panel and in the WebSite X5 Manager app, where you can display, dispatch, file or delete the orders you receive. Tick the Enable Push notifications option in the new window. We hope you'll agree that creating an online store to sell digital products isn't complicated. Just think of something you're good at and that people would be prepared to pay for, transform it into a product (an ebook, a video-course, a graphics resource, etc) and put it on sale on your website. With a touch of enterprise, it could soon become an important source of income for you.